Please read this mail with full love and devotion. I would like to share with you all an incident of Shirdi Baba's appearance during a wedding. The incident of Baba's appearance, the version of which I have heard, is as follows. The bride who is a devotee of Baba went along with her parents to Shirdi a few days before her marriage. She grew so emotional there that she wept before the Samadhi of Baba with an invitation to attend her marriage. Later the marriage was performed as planned. After the marriage celebrations was over the bride remembered her prayer to Baba at Shirdi and then wept in the night just before going to bed that she never experienced Baba's presence during the marriage. That night Baba came in her dream and said: "Do not feel sad. I was there during your marriage. Open the album of photographs of your marriage and see the photo where you are all going in the procession. You can see me in that photo." The same photo is attached. I was overwhelmed looking at that picture of our sweet and simple Baba.Thank you so much for sharing this picture with us. Anybody does have her details... If so please write here. OMSAIRAM Shammi ji , the photograph u were looking for. What a Co-incidence ! This Morning itself me and my friend were Discussing regarding this miracle and i was surfing web for the same matter,but i was not able to find it,he said that happend in Coimbatore..,Suddenly i opened this colum Your exp with sai i found this matter.. This is incredible.Just shows that Baba is with true devotees always.This is beautiful. Thanks for showing us the photograph. Kiya Shammi Sab Kutch toh Ho Raha Hai!!! Aur Kiya Chaiye Hum Sab Ko!!! Isse Ache Darshan? Just Incredible!!! Dear Ramesh bhai And Dipika dear !! Shabir bhai his family in shirdi and myself ( when i went to their home ) to meet them ..
We were talking about Sai baba ..and they came up this incident during our conversation ..
Tho Unke amma Bole ke "hamare Sai Baba ne khud abdul baba ka bete ka shaadi kiya tha Tab"
Waisey hi Baba heee tumhare kanyadhan bhi karenge ..
Tho Jab mere dipika ne Doli ke baath ki na Ramesh bhai muje tho bilkul yahi incident yaad aya tha !! Aur Deko hamare Dipika dear bilkul connected hai .. idhar ..
Aur Aap bhi tho .. !!! BABA your leelas are breathtaking and strange. Bless we are to see that picture. Bless your children always baba. 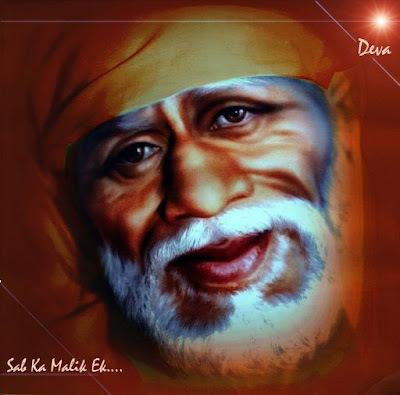 Omsai Sri sai Jay Jay Sai. Oh... aren't we lucky? Thanks baba for showing you picture. I cannot believe that I just saw baba in that picture. Baba your leelas are great! Page created in 1.014 seconds with 69 queries.